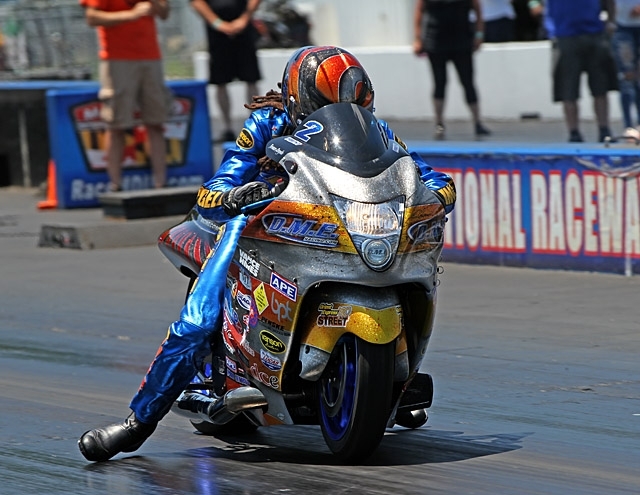 Winston-Salem’s DME Racing—and indeed everyone on track at the International Drag Bike League’s recent MTC Engineering Summer Nationals—were dealt a tricky racing surface to manage. 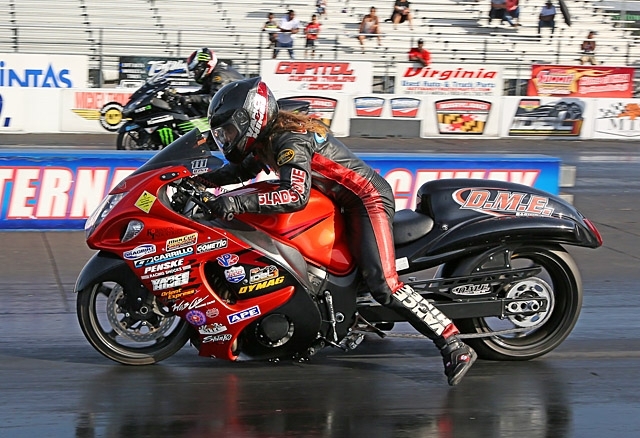 A recent repaving from 330 feet on of Maryland International Raceway’s quarter mile caused the nearly 700 horsepower Orient Express Pro Street bikes to struggle in the heat of day. 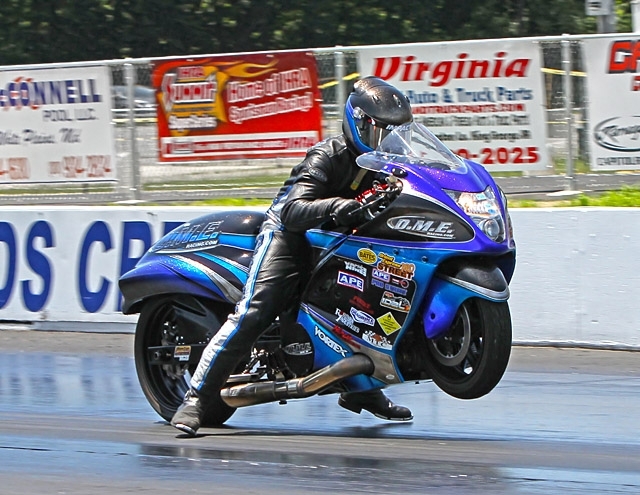 Two-time Battle Royale winner Terence Angela was the weekend’s performance leader, qualifying number 1 with a 6.87 and top speed of 219.15 mph. But this weekend you needed the right lane to apply the power of a DME turbocharged Suzuki Hayabusa, and Angela found himself in the left for the final against teammate Joey Gladstone. Angela wasn’t able to stay on the power in the final and watched from behind as three-time champ Gladstone won the all-DME final. DME teammates Jason Dunigan and Chris Connell Jr. both advanced to the second round of Pro Street eliminations before falling to Angela and Gladstone, respectively. Gladstone fell on the other side of the lane choice divide in the final of DME Racing Real Street. 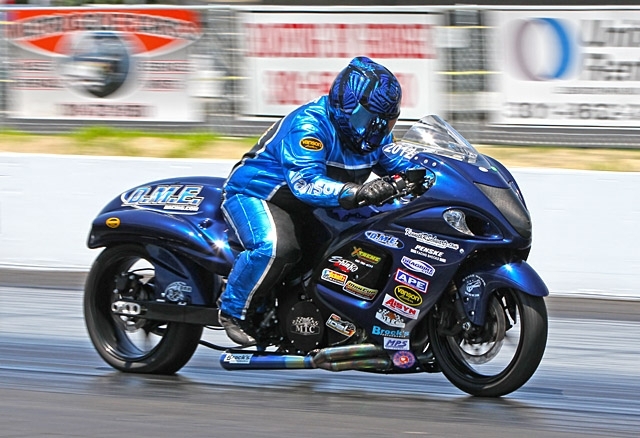 The first 60 feet is vitally important to Gladstone’s all-motor DME ‘Busa against power-adder bikes like that of fellow finalist Anibal Merced. Joey got a jump at the tree, but a left lane spin was costly as Merced applied the spray and took the stripe. DME sponsored sportsman racer Dustin Lee scored two wins—Saturday’s Shinko Pro ET and Sunday’s Brock’s Performance Street ET. Lee—whose bike is stacked with DME parts from the subframe to the triple tree and down to the oilpan—beat Shayne “Mr. Money” Proctor in Saturday’s final and Larry Knosp on Sunday. Team boss Dimey Eddinger, tuner Andy Sawyer, engine builder Skip Gladstone, and the whole DME team look forward to racing next at Memphis International Raceway on July 23-24 with the Manufacturers Cup.